Central Park has always been home to romance — did you know a popular path for couples named Lovers' Lane once existed where Turtle Pond is today? These days, there are so many date spots in the Park that planning a romantic outing can be overwhelming. Whether you're visiting for a first date or a longtime anniversary, here are 10 ideas for a fun getaway in the Park. 1. Share secrets at the Whisper Bench. Tucked away in Shakespeare Garden is the Charles B. Stover Bench, also known as the Whisper Bench. Whisper into one corner of the bench, and the sound of your voice will travel to the other side for only your partner to hear. It's the perfect spot to sit, reflect, and share sweet nothings. Afterwards, explore the blooms and paths of the Garden — and try to find the many bronze plaques with quotes from William Shakespeare's works. 2. Go on a walk through the Hallett Nature Sanctuary. Take one of the long, winding paths in the Hallett Nature Sanctuary, which opened daily to the public only a year ago. Regardless of which direction you go, you'll either find comfortable rustic benches, beautiful views of the Park and midtown, or both. The native plants and diverse wildlife — did you know the Hallett was preserved as a bird sanctuary for decades? — make you feel like you're far from Manhattan. 3. Take in a different perspective at the Point in the Ramble. Most people know that walking across Bow Bridge or boating in the Lake are classic Central Park dates. Put a twist on these go-to romantic activities by visiting the nearby Point in the Ramble. A short walk from the Loeb Boathouse, this lush peninsula juts into the Lake and offers lesser-seen views of Bethesda Terrace and Bow Bridge. Take a seat at one of the area's many rustic benches and you'll feel like you're on an island in the middle of the Lake. 4. Have a quiet picnic at Summit Rock. Summit Rock, a massive outcrop, is the highest natural elevation in Central Park. This off-the-beaten-path date spot comes with plenty of seating and open space. On a warm day, it's a great spot for a picnic. In the wintertime, the bare trees give you a glimpse of midtown. Looking for more sights? Summit Rock provides a view down West 83rd Street — if you look closely, you can even see New Jersey. 5. Take in the skyline views from the Met Museum and the Reservoir. The Metropolitan Museum of Art has called Central Park home since 1880. For one of the topmost views within the Park, visit the Museum's rooftop garden from May through October (weather permitting). After enjoying the view, take a walk around the nearby Reservoir, one of the best places in New York City to watch a sunset. 6. Act like a kid at the Pinetum Playground. Looking for a more playful date? The Pinetum Playground, surrounded by Central Park's largest collection of pine trees, is popular among adults, as well as children, because of its open setting. Ride the swings before enjoying a picnic at one of the Pinetum's outdoor tables. 7. Escape the City in the North Woods. Perhaps the most secluded and peaceful area of Central Park, the North Woods features beautiful arches, winding trails, and peaceful waterfalls. Impress your companion by showing them the Park's oldest building, the Blockhouse. 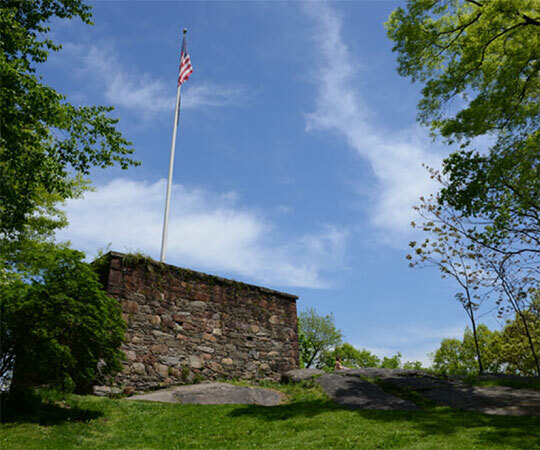 It's the only remaining fortification of the many built in the area for the War of 1812, and features many surrounding places to take a seat and relax. 8. Choose your own adventure. There are endless paths to travel in Central Park — find a new route with our self-guided walks. Want to impress your partner with a personal exploration of the Park? Take a custom walking tour and get a deeper perspective on your favorite Park spots. We also offer a personal tour of Conservatory Garden — home to hundreds of annual and perennial varieties, 80-year-old crabapple allées, and beautiful fountain sculptures — with the Garden's curator and director, Diane Schaub. 9. Take a ride on the Carousel. Enjoy calliope music while riding on one of the Carousel's 57 magnificent horses. Dedicated in 1951, the Carousel was discovered in an old trolley terminal on Coney Island, and it's the fourth to stand in the Park since 1871. It is believed that a live horse, hidden beneath the Carousel platform, powered the original amusement ride from 1873 until 1924. 10. Play games at the Chess & Checkers House. Bring your game night to the Park! Challenge your partner to chess, checkers, and more at the Chess & Checkers House. This visitor center contains indoor and outdoor chess and checkers tables (game pieces are available to borrow from our staff) and other games like Jenga, Scrabble, and Parcheesi. Whether you're looking for a classic date spot like Bow Bridge or a quiet trip to the North Woods, there's no shortage of ways to celebrate your love in New York City's backyard. Looking for a more permanent way to express your adoration? Surprise your sweetheart with a personalized plaque on one of the Park's benches or dedicate daffodils, tulips, or mums in the Park to your special someone.